Abu Marwan Abdal Malik Ibn Zuhr, known in the west as Avenzoar, was born in Seville in 1094 CE. He received his education at the University of Cordoba, specializing in medicine. Ibn Zuhr came from a highly educated family which produced many good physicians including two female physicians who served at the palace of Almohad ruler. He started his medical practice in Seville, but after some time he fell out of favor of the ruling king, so he had to flee from Seville but he was apprehended and jailed in Marrakesh for a long period of time. After about two decade Almohad dynasty conquered Seville and Ibn Zuhr returned to his beloved city again. He devoted his time in medical practice, research and teaching till he died in the year 1162 CE. Ibn Zuhr was one of the greatest physicians and surgeons of “the Muslim golden era,” and is considered the father of Experimental Surgery. Contrary to the general practice of the Muslim scholars of that time, he confined his work to medicine and surgery only. He was highly critical of the four humors theory, which was supported by the Greek philosophers like Hippocrates and Galen. Ibn Sina was also a supporter of this theory which later proved to be incorrect. As a physician, he made several discoveries and breakthroughs. He was the first physician to describe correctly the cause of scabies, and explained that the disease is caused by some sort of parasite, thus he may be regarded as the first parasitologist. Likewise, he developed a method of direct feeding through the gullet in cases where normal feeding was not possible. He also gave clinical descriptions of tumors, intestinal phthisis, inflammation of the middle ear, etc. Ibn Zuhr’s chief contribution can be found in the monumental work Kitab al-Taisir fi al-Mudawat wa al-Tadbir (Book of Simplification concerning Therapeutics and Diet). In it, he described several original contributions he had made. The book gives in detail pathological conditions, followed by therapy. Ibn Zuhr gave the idea of performing experimental surgery on animals. He invented the surgical procedure of tracheotomy, and perfected it by doing the experiment on goats–thus he brought in the era of experimental surgery. He was one of the first physicians who tried to establish surgery as an independent field of medicine and suggested training courses meant especially for future surgeons. Parenteral procedure (delivery of medicine to desired part of body) had never been tried on a patient before, Ibn Zuhr was first to try it by using a silver needle, which he invented. He described in detail about this new method in his book titled Method of Preparing Medicines and Diet. Neurological disorders were not very well understood in the Middle Ages. Ibn Zuhr was the first to give accurate descriptions of the mental disorders which included thrombophlebitis, meningitis and other related diseases. He also formulated the medicine for these kinds of diseases, thus he is credited for the contribution to the modern neuropharmacology. He wrote a book on early pharmacopoeia (The Art of Drug Compounding) became the standard book on this subject for a long time. Modern anesthesia was developed in Muslim Andalusia, in which Ibn Zuhr had great contributions along with al-Zahrawi, another Andalusian surgen. Ibn Zuhr used both oral and inhalant anesthesia and performed many surgeries with the use of narcotics soaked in sponges placed on the face of the patient. He perfected the procedure by adjusting the dose and concentration, and thus made the original contribution in the field of anesthesiology which made surgery practical. In the Middle Ages, dissection of the human body was considered a taboo, so physicians never undertook this project. Ibn Zuhr broke the tradition and conducted dissection and postmortem autopsy on human bodies and brought the field of medicine to the modern age. Dissection of bodies brought some new information to the medical science which was not available before. Ibn Zuhr authored many other books related to medicine. His book Kitab al-Iqtisad fi Islah al-Anfus wa al-Ajsad (Book of the Middle Course Concerning the Reformation of Souls and Bodies) gives a summary of diseases, therapeutics and hygiene, written especially for the benefit of the layman and physician. His other book, Kitab al-Aghziya (Book on Foodstuffs) describes different types of food and drugs and their effects on health and the human body. Ibn Zuhr in his works lays stress on observation and experiment, and his contribution greatly influenced medical science for several centuries–both in the East and the West. His books were translated into Latin and Hebrew and remained popular in Europe as late as the binging of the l8th century. Ibn Zuhr was one of the greatest physicians and surgeons of the Middle Ages–he made so many important original contributions to medical science. Hamza Sheth is a co-researcher at post graduation level. Department of Pharmacology, Luqman college of Pharmacy, Gulbarga. Karnataka state. Defence Minister A. K. Antony and the Three Service Chiefs, General V.K. Singh, Admiral Nirmal Verma and Air Chief Marshal P.V. 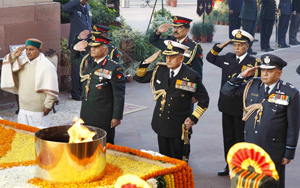 Naik paid tributes at the Amar Jawan Jyoti to mark Vijay Diwas, 39th anniversary of the victory day of the 1971 India-Pakistan war, in New Delhi on December 16, 2010.